Protecting you children from the sun is one of the most important things you can do to ensure they maintain healthy skin. Young children are at a high risk for sun damage because their skin pigmentation is still weak. As your children age, their skin pigmentation becomes stronger. However, that does not mean they can spend endless hours in the sun without protection. Learn how to keep your children’s skin safe from sun damage. It is not an easy chore to protect children from the sun. Children love to play outside. As a responsible parent, you need to become creative. Apply a high SPF sunscreen to protect them from the damaging rays of the sun. However, that high SPF sunscreen is not going to fully protect them. This is where parents and caregivers must look for ways to protect children without it being noticed. Sunglasses – These are very important for protecting the child’s eyes. Unfortunately, the plastic ones you pick up in a four pack at the dollar store are not very effective. Therefore, you will need to purchase inexpensive “regular” pairs of sunglasses with UV protection. Now, you need some cute stickers made of felt or foam. These come in a variety of shapes or objects that children like. Help them decorate the new sunglasses. If the child likes the looks of the sunglasses, he or she will be more likely to wear them! Hat – Your children need a hat to protect the scalp, face and ears. Let each child pick out a wide brimmed hat of his or her choice. Make sure the brim is large enough to protect the areas that need protecting, but not so large that it will obscure view while playing. In my experience, stiches are not any better than sunburn! Allow children to decorate their hats just as you did with the sunglasses. Peak time – Let us look at a few ways to protect children from the sun during the peak hours of 1pm and 3pm. A great idea is lunch and then a movie. Other ideas include reading time, board games, and practicing a musical instrument. That should cover the two hours you do not want your children in the sun. If you have a young child who still nap, you are in luck. You can arrange his or her naptime during the sun’s peak hours. Clothing –Your children’s clothes should include lightweight long sleeve shirts and pants for protection. That is, if you can get them to wear these items in the summer. Most children will want to wear shorts and short sleeve tops. If the child insists on the summer attire, make sure he or she comes in the house frequently for rest periods or plays in the shade often. If your child has a tree house, that’s a pretty safe haven from the sun’s rays. Check the weather – Another way to protect children from the sun is to check the forecast for the week. On the hottest days when the UV index is high, plan to take them to a movie or an indoor activity that day. Protecting children from the sun is a difficult task. All you can do is follow the guidelines provided and teach your children safety regarding the sun. It is unfair to make a child sit in the house during the summer for long amounts of time. If you look back on your childhood, your greatest memories were probably of playing outside with friends during the summer. 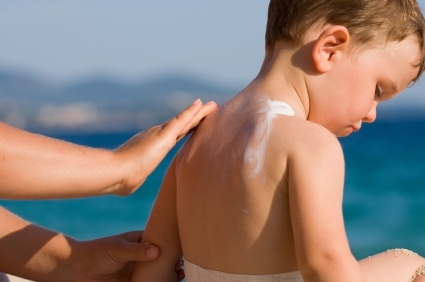 Applying sunscreen is the best thing you can do to protect your children from the sun. Be sure to buy the highest SPF waterproof sunscreen available (100 SPF), and apply from head to toe.